Opana Addiction Treatment: How to Find a Recovery for Addict? Opana, or oxymorphone, is a semi-synthetic opioid developed to treat moderate to severe pain. It is also often used before operations to help keep patients calm and maintain the effectiveness of anesthesia once under. While the medication does have legitimate applications, it also comes with enormous risks, not the least of which is the fact that many users end up needing Opana addiction treatment. Opana is highly addictive because the body becomes dependent upon it quickly and the effects it produces — including euphoria and increased sociability — result in psychological dependence on the drug. However, it is a short-acting medication, which means users take doses frequently to maintain effects. Treatment for Opana addiction is needed to quit abusing the drug which causes many side effects for user’s health. How to Get Opana Abuse Help? What are the Opana Rehab Programs? Opana addiction can arise whether or not the drug is being abused. This is because it is a physically addictive medication, which means the body can become dependent upon it as long as it is taken for more than just a few weeks. Due to its addictive nature, the FDA asked that Endo Pharmaceuticals no longer offer its Opana Extended Release; the company removed the medication from the market. However, regular Opana is still on the market, as are generic extended-release tablets. If someone is addicted to Opana, receiving help for Opana addiction is vital. However, the first step in getting help is admitting there is a problem. For some users, denial is deep, but knowing the signs of addiction can help both them and their loved ones realize that help is needed. Once it is clear an Opana addiction is present, the user and their support system need to start looking into Opana addiction help. Because Opana is an opioid, withdrawal from the medication can be dangerous when done alone. Rehabilitation centers have trained staff and medical professionals who know how to help opioid addicts safely withdraw from the drug they are addicted to. These centers are located throughout the United States, making them easy to access. While there is a lot to consider when choosing a rehabilitation center, it is best done quickly. Opana addiction is dangerous, with the potential for overdose high. The sooner help is obtained, the sooner the user can get back to living a happy and healthy life. Opana addiction treatment isn’t easy. Breaking out of the bonds of addiction is hard work. However, it can be done, and the results are rewarding. Rehabilitation treatment focuses on both getting the user off the drug and helping them remain in recovery. This means addressing the underlying causes of their addiction and building essential skills that will help the user avoid relapse. The sooner treatment is started, the better the results tend to be. Many people worry rehabilitation programs do not work. Everyone knows of someone who has been in and out of rehabilitation more times than they can count—if not someone they know personally, then a celebrity. This makes us think rehabilitation for Opana, and other drugs isn’t useful, but the research says otherwise. In general, when users go in with a positive or hopeful mindset, recovery programs work. And these programs are not one-size-fits-all. Another reason many people think rehabilitation is not for them is that they have a specific idea of what it will be, and what they are picturing won’t work for them. In truth, there are many different Opana addiction treatment options available for users to choose from, allowing them to select one which is truly a good fit for them. There are different types of therapies used, different locations, long-term and short-term options, and residential and outpatient programs. Ultimately, the right program is out there. There are numerous Opana rehabilitation programs in the United States. Because opioid addiction is so common, the majority of clinics can treat Opana addiction. This means the hard part is not finding a center for treatment but finding the one best suited to the user. Recovery from Opana addiction is more likely to be successful if the user is happy with the program they are enrolled in. Residential or Outpatient: In general, Opana addiction requires residential treatment at least through the detoxification process. After that, the patient will be able to choose between remaining at the facility for further treatment or switching to outpatient care. Patients who are worried about relapsing should stay at the center until they are confident in their abilities. Long-Term or Short-Term: Because opiate addiction is difficult to break away from, long-term treatment is recommended. However, it depends on how severe the addiction is. Ultimately, the patient can have a preference but should defer to the guidance of their doctor. Treatment Goals: The user should have specific goals in mind which go beyond getting off the medication. 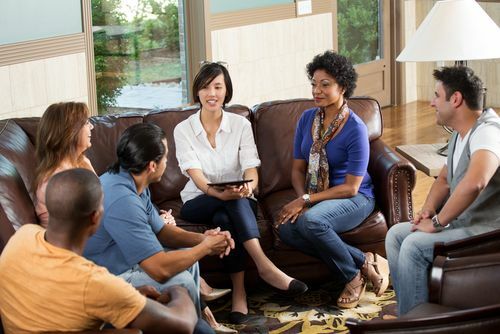 Common goals for patients in drug rehabilitation centers are developing better self-control, learning to focus more on important relationships, and living a healthier life all around. Types of Therapy: No two rehabilitation centers are the same in their approach to treating drug addiction. Some centers take a highly clinical approach, while others create a real community within the treatment center. Some focus on athletics while others focus on nature. Some use pharmaceuticals throughout the process while others only use them during detox. The user needs to know what they want regarding the therapy offered. Because users often want to stop abusing Opana, they can feel rushed to choose a center. Although getting off the medication as soon as possible is important, so is finding the right facility to be treated at. By speaking with addiction specialists, selecting the correct rehab for Opana addiction facility should not take long. Addiction is a topic that makes many people uncomfortable, and that makes admitting there is a problem difficult to do. However, there is no shame in suffering from addiction, especially when seeking treatment. Opana addiction treatment centers do not judge the fact that a user is addicted or how that addiction came to be; they only seek to help. No matter the path that led to addiction, there is a road to recovery. Opana addiction help should be sought before it is too late. Opana is very addictive and difficult to stop because of its pleasant high effects. Not only is relapse likely when quitting without help, but the withdrawal process can be deadly. Professional Opana addiction treatment ensures the user can quit the drug safely while developing the skills and perspective needed to remain in recovery for the rest of their lives. If it is clear there is an addiction present, it is time to seek Opana addiction help. If you or a loved one are addicted to Opana and are ready to get the help needed to stop abusing the drug, our addiction specialists are ready to help you. To learn more about centers treating Opana addiction, speak with us at (888)-459-5511.